Do you update your restaurant's menu regularly in response to customer demand or seasonal availability? 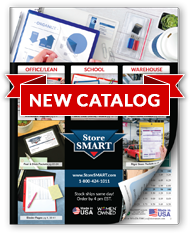 StoreSMART's Dinner Style Menu Covers offer the flexibility you need to serve your customers! The crystal clear front, back, and interior pockets are the perfect size for 8 ½" x 11" sheets, giving you the ability to print menus on demand—and protect them instantly. You'll save time and money by using our Six-Pocket Menu covers, too—the reinforced edges provide outstanding protection against wear and tear, and spills and grease wipe right off the archival quality polypropylene plastic. With a beautiful selection of colors to choose from, you can match your menu to your d�cor, or color-code different menus to boost the efficiency of your servers. You work hard—so invest in menu covers that work hard for you! Made of archival quality polypropylene plastic. This tough, yet flexible plastic won't stick together, crack, or pick up ink from your menus. Inside capacity: 8 ½" x 11". Six visible pages (front, back, and four interior) with colored dividers. Dividers not only provide lovely decorative frames for your 8 ½" x 11" menu pages, but contribute additional stability. Menus slide in and out easily. Spills wipe right off. The Dinner Style size is ideal for restaurants, diners, cafeterias, bed and breakfasts, bars, room service, schools, fast food, coffee and dessert bars, and more. Non-stock colors also available. Minimum order 100 pieces. Click here to order.